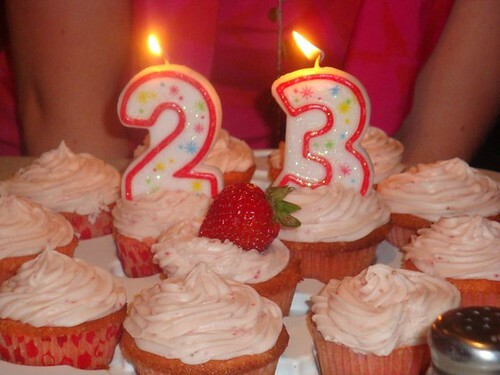 My sweet friend, Leah, turned 23 last week, and for her birthday, I made strawberry cupcakes with strawberry cream cheese frosting. These cupcakes are delicious. 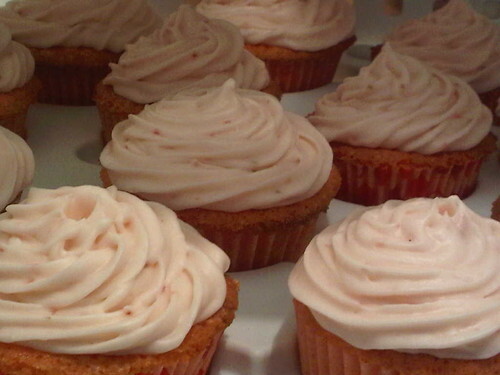 For the frosting, I added strawberry puree to a basic cream cheese frosting recipe. I added quite a bit of extra confectioner's sugar to the frosting to make it stiff enough to pipe onto the cupcakes. In a large bowl, cream together the butter, sugar and dry strawberry gelatin until light and fluffy. Beat in eggs one at a time, mixing well after each. Combine the flour and baking powder; stir into the batter alternately with the milk. Blend in vanilla and strawberry puree. Divide the batter between the prepared cupcake liners, filling them about ¾ of the way full. Bake 18-20 minutes or until a toothpick inserted in the center comes out clean, rotating the pans halfway through baking. Allow the cupcakes to cool in the pan 5-10 minutes, then transfer to a wire rack to cool completely. Place strawberries in the bowl of a small food processor; process until pureed. In the bowl of an electric mixer fitted with the paddle attachment, beat together butter on medium speed until light and fluffy. Add in the cream cheese and beat until combined. Reduce mixer speed and slowly add confectioners’ sugar; beat until well combined. Add vanilla and 3 tablespoons strawberry puree (save any remaining strawberry puree for another use); mix until just blended. Do not overmix or frosting will incorporate too much air. Frost the filled cupcakes with the frosting. Refrigerate until ready to serve.